Loewe's collaboration with cult boutique Paula's Ibiza celebrates the Balearic Island's laid-back, bohemian spirit. 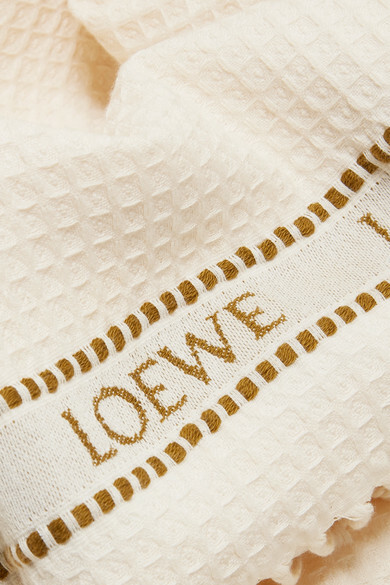 Woven with the label's logo, this towel is made from breathable waffle-knit cotton with frayed edges and tasseled ends. Tuck it into a basket bag when you're heading to the beach, then wrap it around your shoulders when it's time for lunch. Shown here with: Hunza G Bikini, Loewe Shorts, Loewe Tote, Loewe Sandals, Valentino Earrings, Sophie Buhai Anklet, Meadowlark Ring, Chloé Bracelet, Chan Luu Necklace.